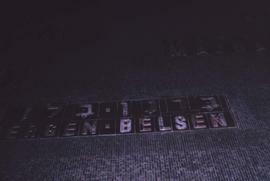 Colour Kodachrome 35mm slide depicts a Holocaust memorial with the words "Bergen-Belsen" in English and Hebrew, possibly in Jerusalem; image is very dark, possibly taken at night. 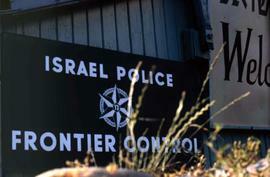 Colour Kodachrome 35mm slide depicts the sign posted beside the "Welcome to Israel" sign, which reads "Israel Police Frontier Control." Agfachrome 35mm slide depicts the "Old Jericho Rest House" building, in Jericho, Israel. Colour Kodachrome 35mm slide depicts a sign which reads "Welcome to Israel." Photograph depicts a group of people outside. Photograph depicts a group of people standing at drink table including Judy Mandleman. The sign reads "CP Jerusalem Plaza Hotel, Mazel Tov to our 250 000th Guest".On verso: Dec. 8/77. Photograph depicts the town of Karmiel.Caption reads: "A view of Karmiel, a residential town in Galilee, built on land which, before JNF reclamation, was covered with rocks as seen in the foreground."